New Zealand has a long history of petroleum production, dating back to 1865, when the Alpha well was dug near seeps in Taranaki. This was followed by other wells in the area and the shallow Moturoa oil field was producing by the early 20th century. The modern era of exploration began in the 1950s with the discoveries of the onshore Kapuni gas-condensate field in Taranaki in 1959 and the large offshore Maui gas-condensate field in 1969, the latter making New Zealand self-sufficient in gas. New Zealand’s EEZ and extended continental shelf covers over six million square kilometres and numerous play types have been identified in a range of petroleum systems in 10 petroleum basins. As of 2014, almost 6.7 Tcfg and 450 MMbo have been produced in the country, which is estimated to have 2P oil and condensate reserves of 240 MMb. New Zealand has a well-developed oil and gas infrastructure and a proactive globally-competitive oil and gas regime. In March 2017 the New Zealand Energy and Resources Ministry (NZP&M) opened the Block Offer 2017 tender for petroleum exploration permits. This tender includes five offshore release areas, two onshore release areas, and one offshore/onshore area, totalling 481,735 km² and covering basins in the north-east, east and south-east of the country. Areas of importance to Māori, plus World Heritage Sites, national parks, nature reserves, wildlife sanctuaries and marine reserves are all excluded. Currently all production in New Zealand comes from the Taranaki Basin and it is thought that exploration has not come close to realising New Zealand’s true potential. 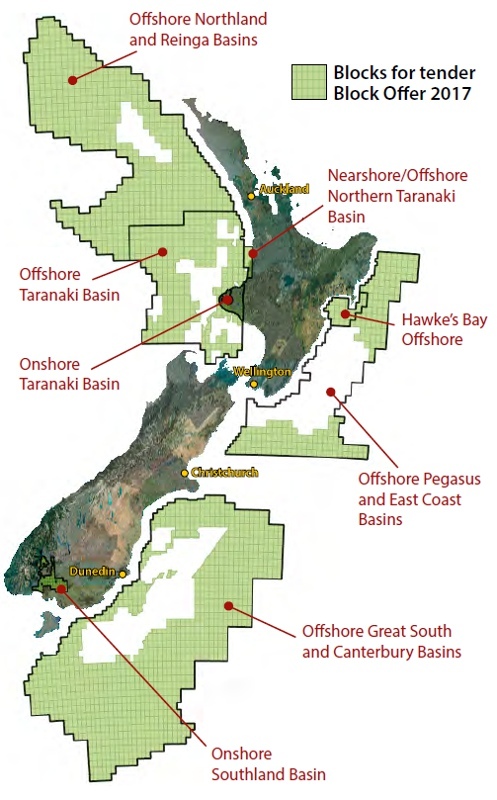 Some of the offered areas, such as the Northland-Reinga and Pegasus and East Coast Basins, are relatively underexplored but have proven petroleum systems and are considered prospective for both oil and gas. The assessment of bids for Block Offer 2017 considers the work the bidder proposes to undertake, their technical and financial capability to carry out that work, their compliance history, and their likely ability to meet New Zealand’s health, safety and environmental requirements. The Invitation for Bids for Block Offer 2017 closes on 6 September 2017 and NZP&M expects to grant permits in December 2017. Endgame for the North Sea? Decommissioning brings uncertainty and there are many concerns but also possible opportunities ahead.